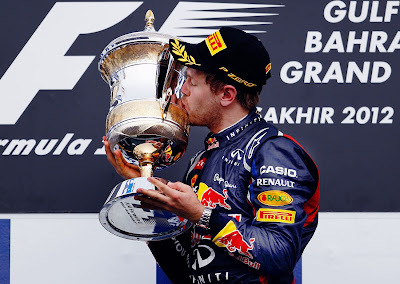 SAKHIR, BAHRAIN – After a very controversial Grand Prix race in the Kingdom of Bahrain, Red Bull Racing’s Sebastien Vettel drove to a significant victory. Lotus driver Kimi Raikkonen mounted a very strong challenge to Vettel, especially considering that he started from the 11th starting position. 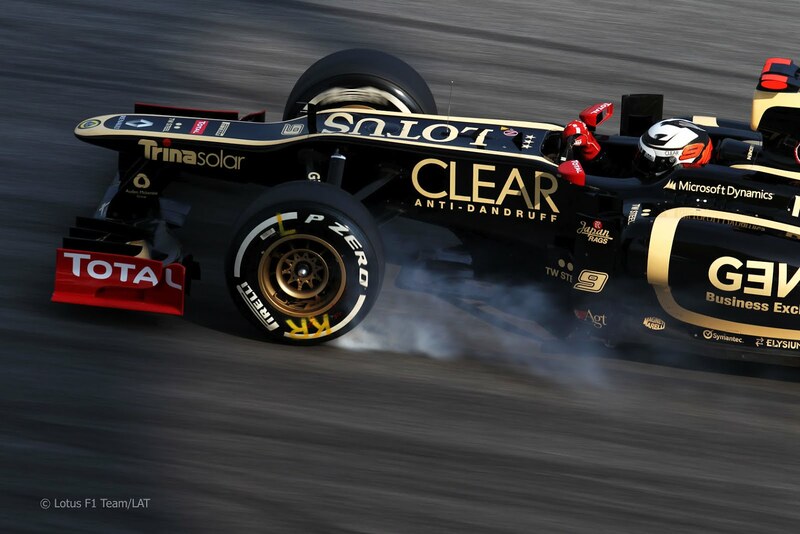 Kimi was running strong at the end, but a late-race tire change gave Vettel the edge. 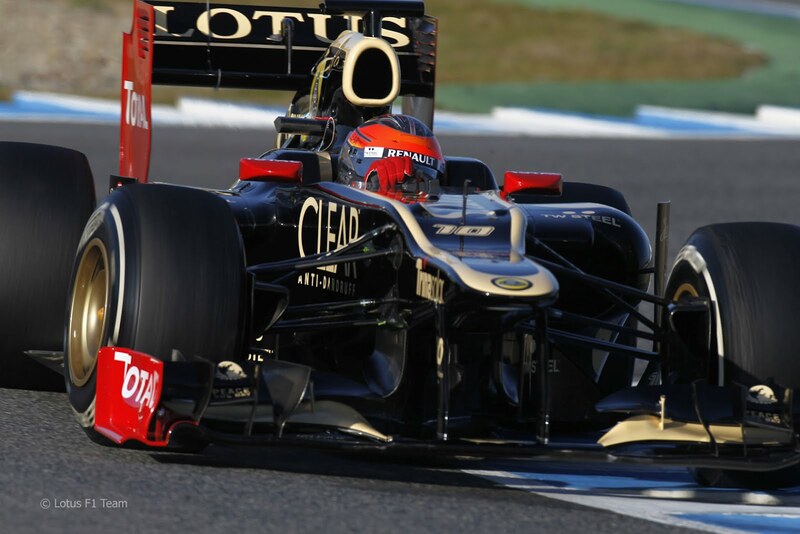 The second Lotus car driven by Romain Grosjean placed third. 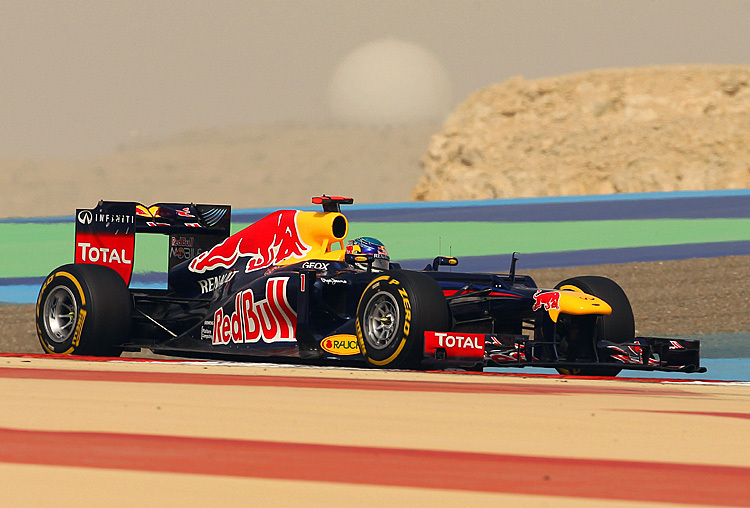 Lotus needed to make a strong performance in Bahrain. The critics had been tough on the 2007 World Champion, but Kimi and his team put in a solid performance. “But at least we got the podium with both cars. After the last race we tried hard and failed, and probably people thought we were a bit stupid. Even after yesterday with what we did,” commented Raikkonen. “But it turned out to be the right decision, and I think the team deserves what we have achieved now. We have been working hard. We’ve not been 100 per cent happy with how the weekends have run so far but finally we’ve got some proper results for the team, so it’s an important step.” Romain Grosjean also made it clear that he is a potential race winner with his first podium finish. “I think we are doing some pretty good starts since the beginning, except Melbourne,” said Grosjean. “Malaysia, China and here we have some very good starts… I have to say that I really enjoyed the first stint, the car was fantastic on the option and I could overtake Mark Webber and then Lewis Hamilton.” I believe there is more to come from this young man. The controversy of the race was due to the political and social unrest in the country stemming from last year’s Arab Spring revolts. 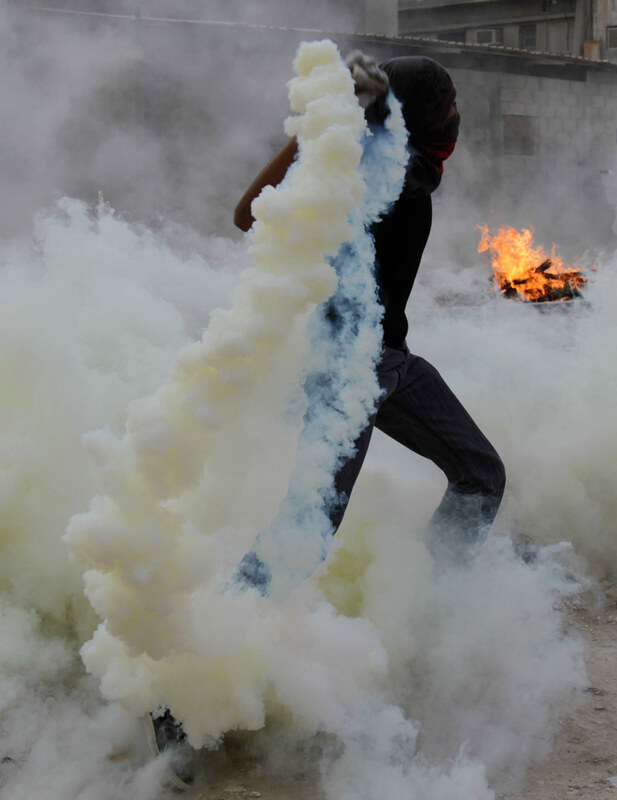 50 people have been killed in Bahrain since the protests began. Last year’s F1 race was cancelled, and many groups have criticized F1 and Bernie Eccelstone for the return of the race to the island-state. Though the race went on without incident, violent clashes between the police and anti-government protesters occurred during the week prior to the race. Drivers and workers reported attacks by Molotov-cocktail wielding youths. Team Force India actually sat out the Friday afternoon practice session due to security fears. This allegedly so enraged Eccelstone, that he ordered that the team be excluded from television coverage. Bernie reportedly commented that "nobody cares" about the cars that are not in the running for pole. 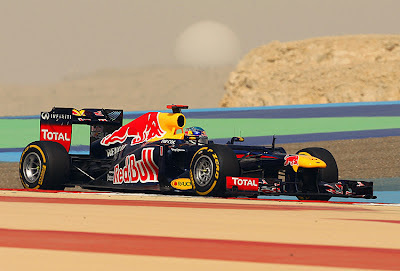 However, the F1 chief executive told reporters: "I suspect it (the blackout) was more to do with the Bahrain laws on no alcohol advertising. They have a whisky company prominently on the car. They should have taken it off. The TV could not show that." McLaren and Sauber removed their usual alcohol sponsors from the cars; however Red Bull was aptly covered although sporting their Singha Beer logos. Force India's deputy team boss Bob Fernley, in charge this weekend in Vijay Mallya's absence, would not comment. The No. 4 Compuware Corvette pair completed 84 laps on the 1.968-mile temporary circuit, finishing 4.26 seconds ahead of the runner-up No. 56 BMW. Antonio Garcia and Jan Magnussen brought their No. 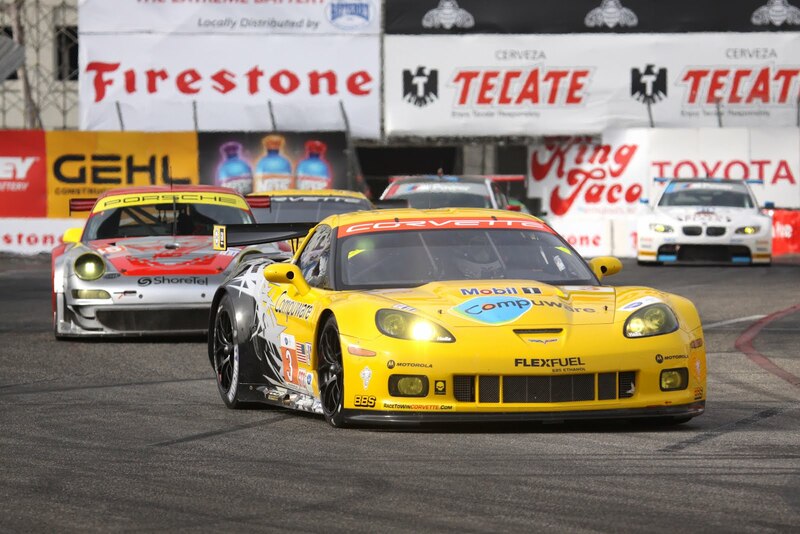 3 Compuware Corvette C6.R home in fourth place after a first-lap accident left their car battered and bruised. 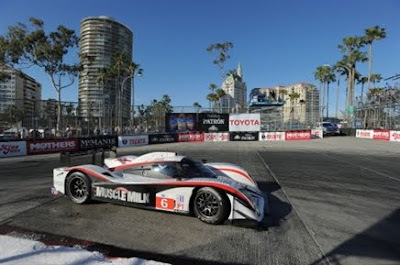 The win was the first for the Milner/Gavin driver combination, and Milner's first career ALMS victory. "Finally a win!" exclaimed the 26-year-old racer. "I've been racing in the ALMS since 2006, and I've had podium finishes and great races. I felt confident that we had a car today that would be competitive and comfortable to drive. We were racing hard, but I kept a gap around me and it worked out well this time. 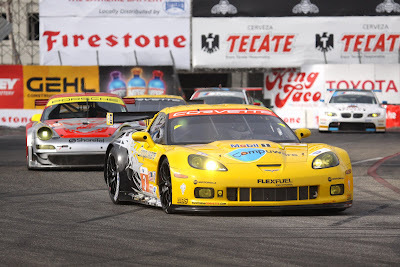 Today the Corvette Racing team had the best combination, and I'm very happy to be part of that." 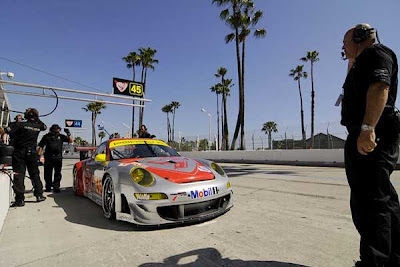 The Porsche GT3-RSR teams had a difficult time at Long Beach. A canceled qualifying session on Friday dashed the hopes of Bergemeister/Long Flying Lizard Motorsports entry for a good starting position. Though the street-course is notorious to passing, Long was able to move quickly from 10th to 4th, but a punctured tire, causing them to drop down a lap, dashed their hopes for the podium. 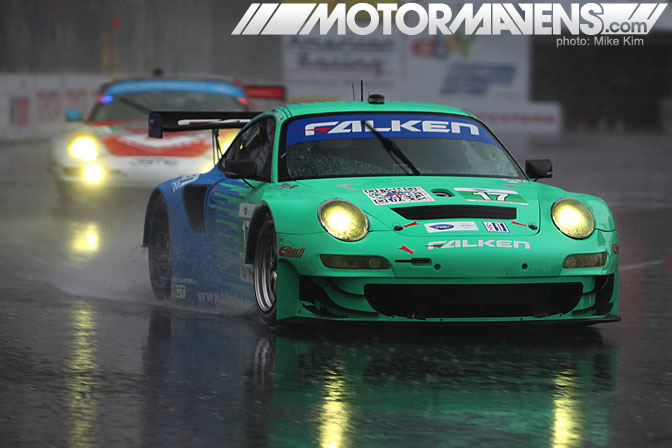 The best placing Porsche of Team Falken Tire driven by Henzeler/Sellers managed a sixth place finish. “Rain during the two-hour free practice, resulting in a wet track, and subsequent cancellation of qualifying, did not enable our customer teams enough track time to set up the new Porsche 911 GT3 RSR for its best performance potential. The competitors who finished ahead of us at Long Beach all have a bigger restrictor – thus more horsepower – than we do. We must work with the American Le Mans Series to find a solution that gives us comparable classification to our competitors in this area,” said Hartmut Kristen, head of Porsche Motorsport.